thespudnook has no other items for sale. 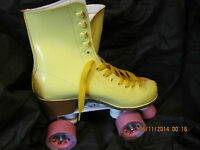 Vintage 70s Fireball Roller Derby Skates Urethane Wheels Size 2 Rare! Women Yellow & White Size 8, heel to toe 9 7/8 inches, No More Rentals! !